Celtic will not underestimate out-of-form visitors AC Milan in Tuesday's Champions League clash, according to manager Neil Lennon. Milan have won only three of their 13 Serie A matches this season, but Lennon has warned against complacency. The Scottish champions are bottom of Group H, but victory against the Italians would keep alive their hopes of reaching the last 16. "If anyone thinks we're underestimating them then think again," said Lennon. Celtic lost to Milan in the San Siro in their opening game of the campaign and were also defeated by Ajax and Barcelona. 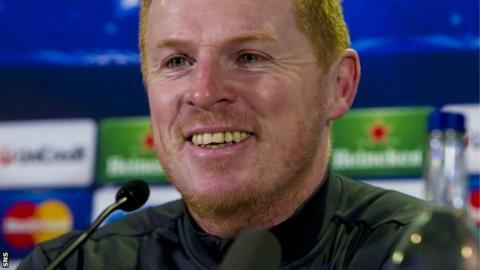 Lennon, who led his side to the last 16 a year ago, has challenged his side to emulate their home win over Ajax to retain hope of European football after Christmas. "In the context of the Champions League, it's our biggest game of the season, because we know we have to win," he said. "Qualifying from this group would unquestionably be a bigger achievement than last season, because it's a tougher group and Celtic are undergoing a rebuilding process." The Italians arrived in Glasgow on the back of poor league form, the sit a lowly 13th in Serie A, and they have failed to win their last five matches. Pressure has mounted on coach Massimiliano Allegri, but Lennon does not believe it is necessarily the ideal time to play the Rossoneri as Celtic aim to keep their own last 16 hopes alive. "They could be a wounded animal and that's always a dangerous proposition no matter who you face," he said. "They'll have their pride. They have some world-class players, players who are class acts and who have been at the top level of the game for a concerted period of time. "This team is dangerous. They've beaten us, they've drawn with Barca, they've drawn away in Amsterdam, so their results in the group have been solid. "They know if they win, they've got a great chance of going through themselves. "I watched their game on Saturday and they dominated the game against Genoa and were unfortunate not to win. "Some of the football they played, and the tempo they played at, was of a very high calibre." The Scottish champions sit bottom of Group H, but a win over Milan - combined with Barcelona denying Ajax victory - would see them move into second spot. "It's a great game for the players to be involved in," said Lennon. "We have performed very well in the group apart from the first half in Amsterdam, so I want that to continue on Tuesday. "I don't think we need much incentive or motivation for the game. We are playing against a very good side, despite what their recent league form is maybe showing."